The Fleet Feet Sports FITLOSOPHY™ is our commitment to the concept of a proper FIT in all aspects of our lives - from our commitment to helping you find the proper FIT for your running shoes, to assisting you in determining how running, walking, or an active lifestyle fits into your life. Simply stated, FITLOSOPHY™ is our FIT Philosophy and our approach to everything we do. Our process begins by ensuring that runners and walkers of all abilities (and ages) are fit with the proper footwear, sports bras and technical apparel to meet their individual needs. We offer a hand chosen selection of footwear brands in varying shapes, fits, and stabilities. Based on your biomechanics, gait, and foot shape we will recommend shoe styles to best fulfill your fitness and everyday footwear needs. Fleet Feet Sports carries a variety of inserts to help support your feet and align your body. Inserts are designed in a variety of shapes and sizes to meet the individual demands of your activities and footwear. Inserts align the bone structure of your feet inside the shoe, creating a consistent and efficient structural foundation. The structural benefits of inserts play an active role in both treatment and prevention of common overuse injuries. 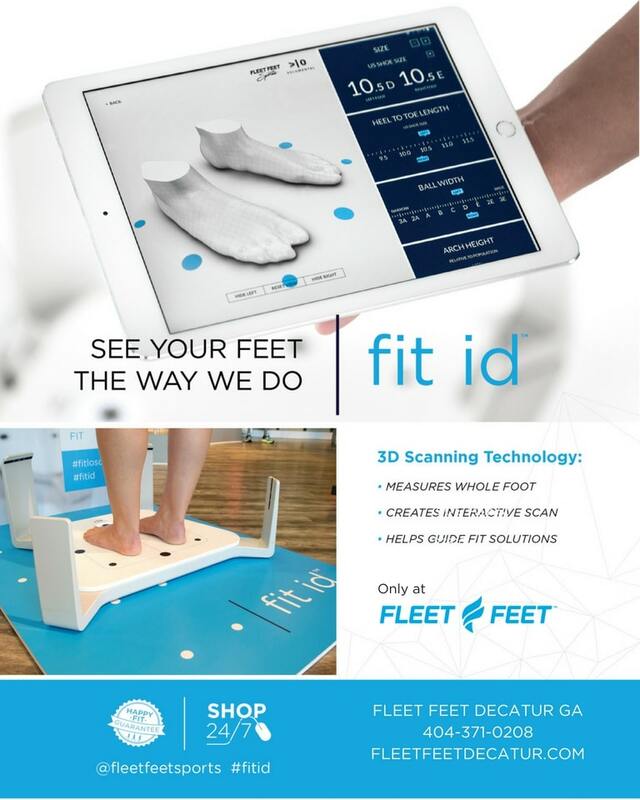 At Fleet Feet Sports we will take you through a measuring process to ensure we fit you with the perfect insert! Choosing a sock that works for your feet and your activity level is a critical component of Fleet Feet Sports’ FITLOSOPHY. Consider the fact that your sock is the layer of material that sits directly next to your skin and is intended to wick moisture and protect your feet from calluses, blisters and other potential irritations. So, why not pick a pair of socks that fits your foot best? At Fleet Feet Sports we recommend that you wear non-cotton, breathable socks for running, walking or other activities. At rest, the average foot releases 1 cup of sweat each day. On a 5 mile run, your feet produce enough sweat to fill an 8 ounce glass. 55% of foot perspiration evaporates through the shoes upper. The other 45% is absorbed in the sock and footbed of your shoe! Two trillion bacteria live on your feet (that’s 12% of all bacteria on the human body). Atlanta Track Club Group Run Details!